This Stunning Red Mini Top Hat Fascinator is a great piece for evening events, parties, or burlesque night. Red glitter mini top hat with satin flower, feathers, lace trim and swirled mesh. An absolutely fantastic mini top hat! 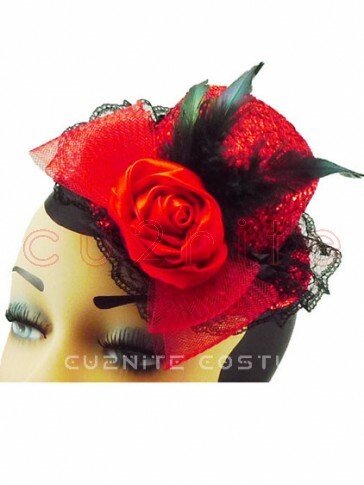 This Stunning Red Mini Top Hat Fascinator is a great piece for evening events, parties, or burlesque night. Red glitter mini top hat with satin flower, feathers, lace trim and swirled mesh. An absolutely fantastic mini top hat! Perfect Costume Idea for Costume Parties, Dress-up Parties, Hens Night Parties, Easter and Halloween. Express Post Service Guaranteed Next day delivery to major cities within Australia. Buy fancy dress costumes at cu2nite.com.au, you will receive high quality products and ultimate shopping experience.